Cohen is co-founder of the online activism group RootsAction.org, which just launched a petition to open up the presidential debates to include four candidates. Cohen also founded the media watch group FAIR in 1986. 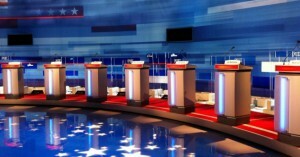 He just wrote the piece “TV Networks Should Open Up the Presidential Debates,” which states: “If ten major TV networks got together and decided to nationally televise a presidential debate restricted to Republican nominee Donald Trump and right-leaning Libertarian nominee Gary Johnson, while barring other candidates including Democrat Hillary Clinton, it would be recognized as an act of media bias or exclusion. Cohen gives a brief history of how the heads of the Democratic and Republican parties wrestled control of the presidential debates from the League of Women Voters, which had been independently organizing presidential debates; Cohen notes: “In 1988, with the CPD taking control of the debates on behalf of the two major parties, the League of Women Voters announced its withdrawal from any debate sponsorship ‘because the demands of the two campaign organizations would perpetrate a fraud on the American voter. It has become clear to us that the candidates’ organizations aim to add debates to their list of campaign-trail charades devoid of substance, spontaneity and answers to tough questions. The League has no intention of becoming an accessory to the hoodwinking of the American public. '” Cohen is currently director of the Park Center for Independent Media at Ithaca College. Tucker is an independent D.C.-based journalist who writes at TheFightBack.org. He has recently written a series of pieces on presidential debates, including “How Presidential Debates Became ‘a Fraud on the American Voter ” and “How Third Parties Are Kept Out Of Presidential Debates“.